TUESDAY - ROQUE NUBLO (7 km, 400 m up and 480 m down)Our hike begins on the western side of Roque Nublo with breathtaking views of the neighboring island of Tenerife and Teide, at 3718m Spain´s highest mountain. Along an ancient "camino real" that we hike up, grow a variety of herbs and medicinal plants, about which we explain in detail. Arriving at the 1750m high plateau below Roque Nublo, at 68m the unique symbol of the island. you can feel the absolute uniqueness of this place. After our picnic, we continue our descent to finish at the village of Ayacata. This tour has a difficulty level of 2. 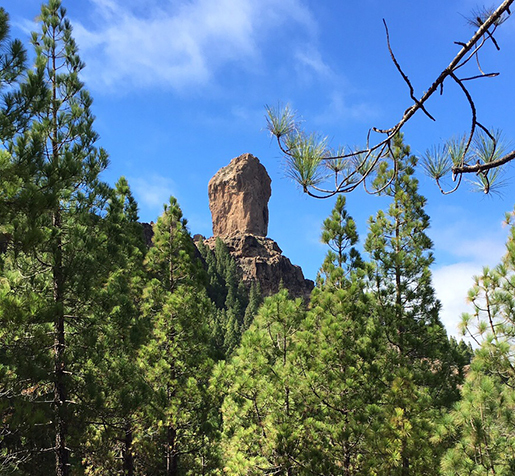 WEDNESDAY - KESTREL CANYON (7.5km, 250m ascent, 250m descent)Into the lush volcano landscapes to see the fertility of the real Gran Canaria Our tour starts in the remote north east of Gran Canaria. This volcanically themed location has specific minerals found in the lava which support rare forms of vegeta¬tion. 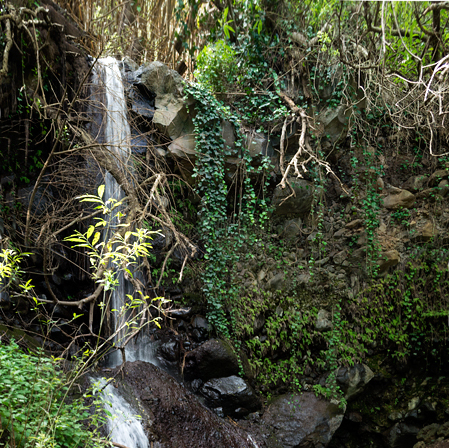 A small stream flows down the valley all year and in the rainy season reforms the landscape and sustains the jungle like vegetation with the humidity and moisture. The tour ends with the visit to the famous cave village of Guayadeque. This tour has a difficulty level of 1,5. FRIDAY - THE LAUREL FOREST(7.5km, 300m ascent, 300m descent)The laurel forest is like a true jungle and magnificant remnants of his forest surivve on the higher northern slopes of Gran Canaria. After a steep climb on forest paths and farm tracks, we are rewarded with some breathtaking views overlooking cultivated countryside and down into lush ravines. The tour is rather on the medium to easy level, with a difficulty level of 2. But it shouldn't be underestimated, although one of the most sensational tours, it can be demanding for really unexperienced hikers. We start from the mountain village of Ayacata standing at 1100m. Here you’ll see the bountiful gardens & small orchards of lemons, oranges & especially almonds. This small niche valley facing south an insight into the agriculture of mountain regions. Along the highest reservoir on the island, we descend steeply into a completely different landscape through pine forests to the famous Parador de Tejeda, on a path through the largest caldera on the island. 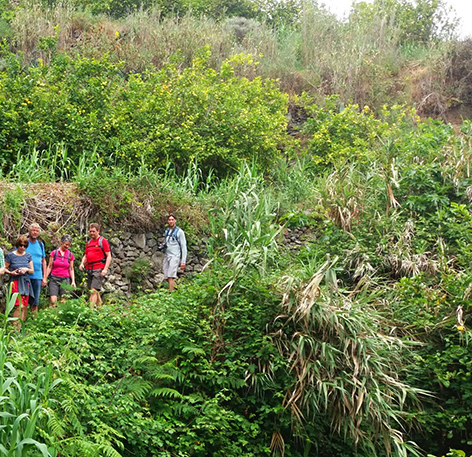 A very impressive hike in the green north of Gran Canaria.